DAN DE LAGO (c. by Encosta de Lago). 5 wins from 1400m to 2400m, R689,325, Clairwood Gold Circle Derby, Gr.2, Turffontein Racing Association H., 2d Greyville Daily News 2000 S., Gr.1, 3d Turffontein London News S., Gr.3. Sire. Golden Falls (f. by Encosta de Lago). 3 wins to 1400m, A$164,950, BRC PMP Limited BRC P., ATC Weathertex H., 2d BRC Your Digital File H., SCTC Wear in Business H., 3d BRC Food & Wine Raceday H.
Gold'n'casino (g. by Encosta de Lago). 2 wins at 1200m, 1400m, Marton JC Coombe Smith Chartered Accountants H., 2d Rotorua RC Marks Ewen & Associates H., 3d WRC The Oaks Stud 2YO H.
Pink Diamonds (f. by Encosta de Lago). 2 wins at 1300m, 1350m, 3d BRC Sequalo at Lyndhurst P.
Tuxedo Royale - Great Nature (Mac.) (g. by Encosta de Lago). 2 wins at 1600m, 2100m in Aust. Booba (g. by Fusaichi Pegasus). 2 wins at 1200m, 1400m in Aust. Argentinian Gold (f. by Husson). Winner at 1400m in 2017-18 in Aust. Golden Future (f. by Mossman). Placed at 3, 3d BRC Aussie Air Conditioning P.
TIGER CAFE (Sunday Silence). 4 wins-2 at 2-at 1800m, 2000m, 240,068,000¥, Nakayama April S., L, Tokyo Fuchu S., 2d Nakayama Shirafuji S., L, Hakodate Tomoe Sho, L, Nakayama Satsuki Sho, L, 3d Nakayama Hochi Hai Yayoi Sho, L, 4th Hakodate Tomoe Sho, L. Sire. I LIKE IT EASY (Pierro). 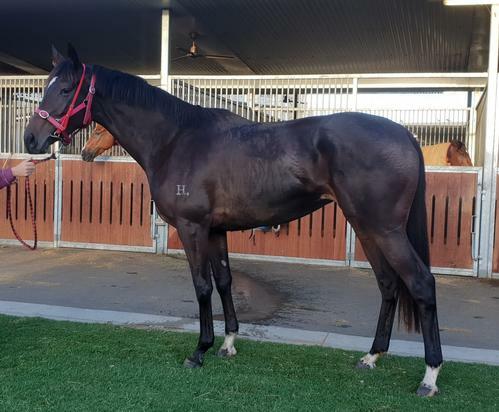 2 wins-1 at 2-at 1200m, 1400m, A$151,845, to 2018-19, ATC Reginald Allen H., L, Tab.com.au 2YO P., 2d ATC Sledmere Stud 2YO H.
FABRIZIO (High Chaparral). 8 wins from 1200m to 1800m, A$539,725, Hawkesbury Gold Cup, Gr.3, VRC James Boag's Premium S., L, 2d TTC Launceston Cup, Gr.3, 3d ATC Australia Day Cup, L, MVRC Moonee Valley Night Cup, L, Hawkesbury RC Ladies Day Cup, L.
THE GOLDEN DANE (Danehill). 4 wins. See above. BRINDABELLA (Bellotto). 7 wins from 1050m to 1800m, A$214,140, MRC How Now S., Gr.3, SAJC OJ Smith Challenge S., L, Classic Mile, L, Magic Millions Carnival H., Morphettville Junction H., Gawler Caravan Centre H., 2d Bendigo Cup, L, SAJC Coolmore Mile S., Feltex Classic Carpets H. Producer. LAWSON'S STORM (Bellotto). 6 wins from 1200m to 2000m, A$206,890, SAJC Birthday Cup, L, Distinctive Lifestyle H., Holden Special Vehicles H., 2d MRC Sandown Guineas, Gr.2, 3d SAJC Adelaide Guineas, Gr.3, Spring S., Gr.3, Classic Mile, L.
PEACEMAKER (Brief Truce). 5 wins from 1200m to 1600m, A$157,630, SAJC CS Hayes Memorial Cup, L, John D Lee S., L, Holdfast Insurance H., Tooheys New H., 2d SAJC City of Adelaide S., L, 3d SAJC RA Lee S., Gr.3, Zena Winser H.